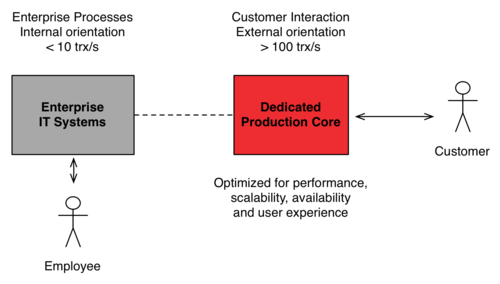 Performance and scalability is important for every production software as it is directly associated with cost, and indirectly with availability, as most vendors overrates the scalability of their software products. While CPU performance and memory cost follows Moore’s law, the performance of most software systems dod not improve at the same rate. The increased performance potential has been absorbed to provide more flexibility and convenience. It is a well-known enterprise-computing dilemma, that there is a tradeoff between flexibility and simplicity. From that dilemma, we can learn that we must not use flexible systems for massive scalable user interactions. With our approach, we separate the operation of the highly scalable user interaction part from the enterprise business processes. While the typical enterprise software processes are well implemented by ERP IT systems, we build user interaction and 3rd party interfaces on a separate and dedicated production software system. © 2019 xiax solutions. All Rights Reserved. Login.